It is essential that you consider mobile in your digital marketing strategy. Mobile websites and mobile marketing can make or break a local business! This means you have to optimize your website for local SEO and for mobile. More than 50% of mobile searches have local intent. Mobile search volume is on its way to surpass desktop search volume. Consumers spend an average of 15 hours a week on their mobile device. Many smartphone users use their mobile device within a store to ensure they get the best price. Consumers compare shops on their smartphone devices. If you’re just starting a business or been around for several years, now is the time to consider mobile marketing. You can’t avoid the facts. So is it enough to focus on billboards, advertisements, social media and great customer service? According to Forbes, mobile marketing is the closest way you can reach consumers. In short, the answer is no. According to several reports, including one from BIA/Kelsey, mobile usage is expected to pass desktop usage within the next year or two. By 2016 it is predicted that mobile local searches will surpass desktop local searches by more than 27 billion queries in a year. What’s the mobile usage behavior for consumers? 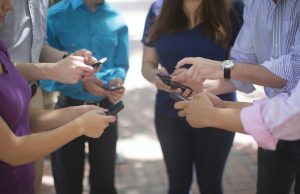 Okay, so you might be convinced that mobile usage is rising, but what’s the behavior of mobile usage? Fortunately, Google Think Insights released a useful, visual report on the statistics of mobile users. 55% of surveyed consumers said they used their mobile device to search for a purchase they planned on making within the hour. Mobile users spend 15 or more hours per week research on their device. Saturday and Sunday are the most common days of the week for mobile searches. Thursday and Friday are the most common mobile app time. Most common searches for mobile shoppers: health & nutrition, automotive products & help and home & garden. Mobile users who prefer branded apps primarily search for financial products, electronics and apparel. Another behavior you might want to consider: Out of the 15 hours spend on mobile searches, consumers visit on average six mobile websites. Fifty-nine percent of those users visited a business’s website. Mobile users will use their devices while they shop. This fact alone will make or break your local business. If you’re site isn’t optimized for mobile usage and your prices aren’t competitive, you will risk the chance of losing a potential customer (while they’re in your store!). Seventy percent of mobile users rely on a store locator app to find a location. So make sure your website is mobile responsive and take the time to input your contact info within the directories! Convinced that a mobile-friendly online presence is right for your local business? If not, you’re at risk of losing potential customers… even while they’re in your store. If you are convinced, fortunately there’s plenty of options for you, from hiring a digital marketing agency like Advice Interactive Group to build you a mobile-responsive website, to taking the DIY approach and using free or cheap theme available on WordPress that are now mobile responsive. How often do you use your smartphone during the week?